Nestled deep in the middle of the more than 70,000-hectare Cat Tien national park is a large freshwater lake that local forest rangers call Bau Sau (Crocodile Lake). The aptly-named lake is home to over 100 crocodile species but to see them requires patience and effort. The local ranger informed us that the best time to observe the long-tailed, hard-skinned and big-jawed reptiles are either when dusk is falling or dawn is breaking. Dawn and dusk are the quiet periods at the lake for the crocodiles to emerge from the tranquil waters and rest on the banks which are bordered with grass bushes. However, most trips to see the crocs are at night when a ranger with a battery-fueled light accompanies his guests on a trip along the banks of the lake to protect them and to show tourists where crocodiles sit onshore at night. When the ranger sees two red spots in the distance, he will tell his guests to be silent as he moves in slowly toward the spots that he knows are the eyes of a crocodile. If luck is on their side, the ranger and tourists can get real close to the crocodile and they may also catch the sight of a herd of deer looking for food on the outskirts of the forest as a reward for their trekking for hours in grass bushes and in the dark wild. The search for crocodiles often ends some hours before midnight, as guests are advised to go to bed early so that they can wake up in the wee small hours in preparation for a boat ride on the lake before the sun rises in the east. It can be a hair-raising trip and not for the faint-hearted. Crocodiles are not usually afloat on the water to wait and greet curious and nervous people on the boat, but sometimes they hit the boat when they move underwater in the lake. 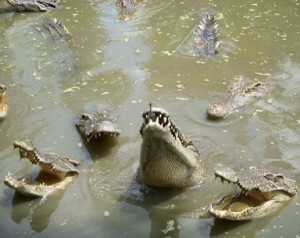 A common scene is of currents of water created by the crocodile when the reptile swims away when the boat approaches. It’s a nice surprise that many birds of different colors are seen perching in the trees and wandering in grass bushes on islets in the lake in search of food. In the early morning and at sunset, these birds sing in chorus and help visitors forget their fears about what is lurking a few feet away under water. The water of the lake is so transparent that it reflects beautifully-shaped old trees and birds flying in the sky, making the lake and surroundings like a picturesque painting. Of course, this painting looks different when the crocs are ready to pounce. Cat Tien National Park is around 150 kilometers from HCMC. A 10 kilometer car drive from the park’s management office will lead to a path, on which adventurers have to trek five kilometers through vast areas of trees to reach Crocodile Lake. It’s worth the effort.